One of the best parts about reading the weekly Wednesday Hodgepodge entries is the other people who participate. Reading about other normal(abnormal) people, etc. And come to find out there is a whole community of post-this-stuff-on-these-days things. Wordless Wednesdays. Six word Saturdays. 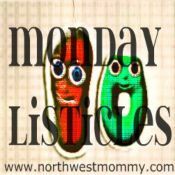 And one that I think I will actually participate in: Monday Listicles. Especially since I have only missed one, so I can post for this week a few days late and then keep up. So here we go! My love for service at my church at at work. My willingness to experiment in the kitchen. Now that the location for my Sunday dinner takes place at B’s house more than mine, it’s harder to experiment on others (I just don’t like leftovers that much). But when given the opportunity, I always try to make something new. My belief that when I am with other people, texting or using my smartphone is rude. My inability to not hit the snooze button and get out of bed. Dude, if the sun came streaming into my bedroom at 430am like it did in Germany, I’d have no problem waking up! My love for Reese’s Peanut Butter Cup Minis and my OCD compulsion in eat them in multiples of four. Really. A giant bag in my fridge will last months as I can only eat 4 or 8 at a time. My twice-yearly retreat with Scrapdoodles and the girls. I don’t care if I don’t scrapbook any other day of the year or if I’m eating dryer lint because I’m so broke. I will go on this trip two weekends a year for my sanity. My Sunday night dinners. Going on six years now we’ve met almost every Sunday to watch that week’s Gray’s Anatomy and spinoff Private Practice. I need these weekly moments to stay sane, and when we don’t have shows to watch we play games to satisfy my competitive streak. My belief that my church is trying, but isn’t perfect just like everyone and everywhere else. And that, until there is a fundamental theological change, I will stick it out. Because I believe in what the church is trying to accomplish and want to help them attain the goals set forth, and despite leadership change and mass exodus to the newly popular church up the street, I’m not going to jump ship. My understanding that my family will drive me nuts, but they are the family I have, so it is what it is. Whew, that was actually harder than I thought it would be! I had to think hard about it, and it kept trying to veer into the ‘things I will change’ territory so trying to follow along took effort! Still, I’m looking forward to this new Monday tradition…. How awesome that you experiment in the kitchen. I’d like to do that more but somehow I have trouble making myself.